Greta hangs out with us boozehounds on the deck. Second (and third) bottle of new-to-me booze is in this cocktail and boy do we have winners. I subbed in green Chartreuse because I could find that at the ABC store (Oh Virginia, I hate your liquor laws so much) which I guess brings it back to the more classic version of this drink. They did, however, have the maraschino liqueur. \o/ I am going to have to make maraschino cherries if I can still find cherries at Whole Foods. Again, I used Bulldog gin because it’s what I’ve got. It’s a London dry so it fits the recipe. I skipped the lemon verbena bit because lazy and didn’t have any. I should add that to the plant list one of these days. I was trepidatious about the Chartreuse after the Campari. In my reading, it would show up in the same sentence as Campari as an herbal liqueur. And we know how much I liked the Campari. However, this stuff was good! It’s herbal in a completely different way that reminds me more of the herbal shampoo I’ve been using for the last decade that I’ve sadly recently developed an allergy to. *whinge whinge whinge* Anyway. 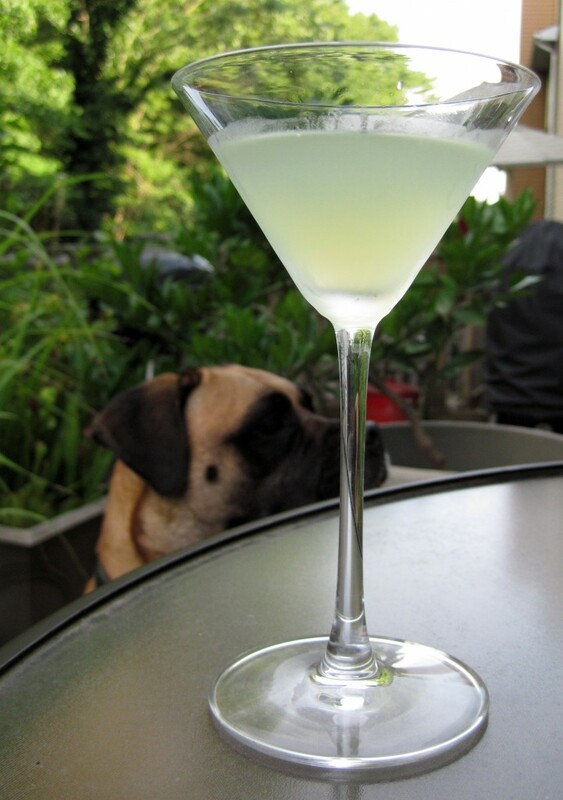 On it’s own, I find green Chartreuse to be sweet and have a delicious anise/licorice taste, especially on the finish. It’s not overpoweringly licorice, but just enough to be noticeable. It actually reminds me a lot of NECCCO wafers, to tell the truth. The drink overall had this amazing floral character. It was the mix of sweet and acidic that I love with this aftertaste of a bouquet in your mouth. I went and tasted the Luxardo maraschino liqueur by itself afterwards and that’s where the taste comes from. Jason says it tastes like drinking perfume and I agree with that. A lot of times when you go to wine tastings, the pourer will talk about how the wine has floral nose but I have never found a wine that was like getting smacked in the palate with flowers like this liqueur. Not a bad thing though! It’s a bit overwhelming on it’s own, but in this cocktail? Marvelous. Overall rating: fabulous summer cocktail. Will drink regularly. The first bottle we cracked open from the intial booze spree was Campari. Now, I had never had it before, but the citrus description made it sound interesting and I decided to give it a go even though I don’t like gin a whole lot. I figured that the rest of the ingredients would cover the gin tastes I don’t care for. Shake all of the ingredients except the orange peel over ice and serve in a cocktail glass. Garnish with the orange peel. This cocktail mixes up into the lovely red drink you see above. I can’t be buggered to put in orange peels, especially when I don’t have any. It turns out that the non-gin ingredients do very much cover the taste of the gin, but it also turns out that I don’t care much for the taste of the other ingredients! Especially Campari. 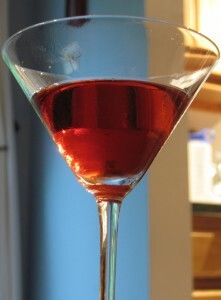 Campari, in my opinion, tastes like chewing on orange pith. It’s a funky, bitter taste that lingered through a 40 minute walk with my dog. Bleck! Jason seemed to like it more than I did, but he also says that the next time he makes it, he’s going to probably use about half of the Campari. He also did a bit of research and found a Negroni recipe that includes a bit of salt. Salt does some good things for bitter flavors, so I may try that to see if it makes it more palatable. Otherwise, I suspect it’s going to be given to a friend of mine. We also bought a bottle of Punt e Mes vermouth upon book suggestion and discovered it has the exact same bitter finish to it. Something to be aware of when buying vermouth.